Bomani is famous for its unique scenery as well as its large herds of elephants, mammals and bird life resident in Hwange. 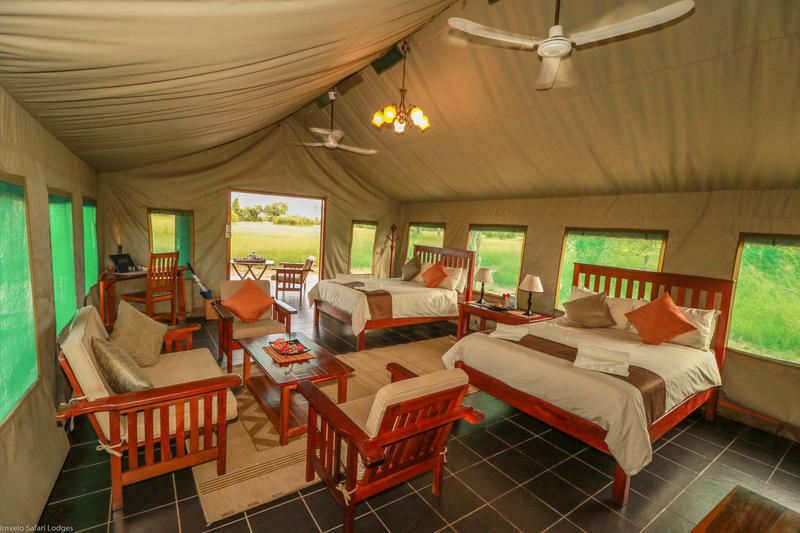 This luxurious tented lodge is situated in a private concession of the magnificent Ngamo Plains, on the edge of the remote and unspoiled south eastern corner of Hwange National Park. Bomani Tented Lodge is approximately 4-5 hours by road from Victoria Falls. Why not travel to Bomani Tented Lodge in style aboard The Elephant Express, a 2 hour rail journey from Dete Station to Ngamo Siding. There are 11 luxury tents and one thatched family bungalow at Bomani, each overlooking the waterhole. Each room is comfortably furnished and designed to keep out all creatures great and small. All the tents have ceiling fans, a private en-suite bathroom, hot running water and electricity by diesel/solar generator. Relax and take in the views of the nearby Bomani Pan from the Main Lodge. Enjoy a drink from bar or take a dip in the private pool. Stay in touch with loved ones at home with complimentary WiFi in the main guest area. This wild and unspoiled bush paradise will guarantee you leave with memories to last a lifetime. Morning and afternoon game drives are conducted by experienced guides in open safari vehicles, accommodating up to 9 guests. On your morning game drives pause to enjoy tea, coffee and biscuits and in the afternoons cool drinks and cooked snacks will be provided. Due to the remote location of Bomani Tented Lodge you will seldom see another vehicle and will receive spectacular insight into the wildlife and environment unique to this part of the park. Usually undertaken in the morning, game walks are an excellent option for photographing big game. Game walks are conducted by a fully licensed and highly experienced armed professional guide. In this remote and wild area every walk provides fascinating insights into Hwange’s circle of life; experience all of Hwange’s wildlife from elephants shaking acacia trees to loosen and then eat the pods to dung beetles rolling up elephant dung containing acacia seeds into balls and burying the balls ready for the seeds to germinate and grow into new trees. Experience the spectacular night time scenes oh Hwange by joining a night drive. Conducted on the lodge’s private concession, trackers operate powerful spotlights to seek out some of the less-seen animals. The light’s red filter lessens the disturbance, thus creating a unique opportunity to view some of Hwange’s nocturnal residents. Highlights include porcupines, springhares, genets, ant bears, pennant winged nightjars and lesser bushbabies. Get up close an personal with big game in one of the waterhole viewing hides at Bomani. Perfect for the keen photographer, the ‘look up game viewing hide‘ at Stoffie’s Pan inside the park has been called the best in Hwange. There are no major rivers supplying water to any watering holes in Hwange National Park. During the dry seasons wildlife has subsisted here on water originally pumped by windmills and more recently replaced by diesel engines. 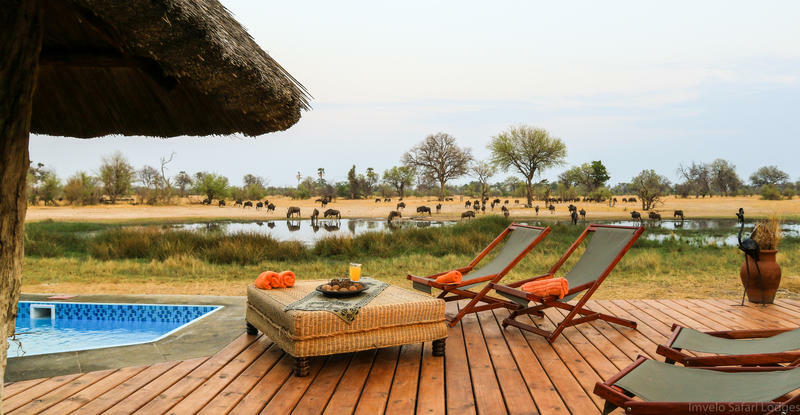 In the southern sector of the Park, Imvelo Safari Lodges shoulders the responsibility for 15 pumped waterholes, approximately 20- 25% of the waterholes that sustain Hwange’s wildlife. The engines require diesel, oil and monthly services and the pump attendants who operate them require rations and pay. A popular activity is to take an all day trip into the Park visiting the waterholes to drop off fuel and oil for the motors as well as rations and supplies for the pump attendants. A picnic lunch is then enjoyed near one of the waterholes followed by a leisurely game drive back to the lodge in the afternoon. Our Pump run usually ends with sundowners at one of the waterholes close to camp. Please note this activity only happens in the dry season when the water is pumped (usually between June – October). In the green season an all-day game drive can be enjoyed roaming across a huge section of the park stopping for a picnic lunch and siesta under a cool tree near a lily-covered pan. The open grasslands and forest groves of the Ngamo Plains around Bomani Lodge are among the most scenic areas of Hwange, this special scenery is ideal for horse-riding and several activity options have been designed for riders of different experience levels. All rides are led by qualified and experienced guides and trackers. The pace is tailored to the riders experience and determined by safety and terrain. It is mostly fast walking and trotting, in open areas we will canter and gallop where possible. Typically between 2 and 4 guests can join an activity; breaks with refreshments are carefully planned to rest both horse and rider. We offer 1 ride for beginners and 4 rides for intermediate to advanced riders. Please note, there is a weight restriction of 90kgs and children under 16 years of age are not permitted (children 7 years and older are allowed on the Beginner Bush Experience).